A 2,000-year-old ancient baby bottle was discovered Tuesday in the Biga district of western Turkey's Çanakkale province. The discovery was made during excavation works in areas of the Hellenistic period antique port city of Parion. 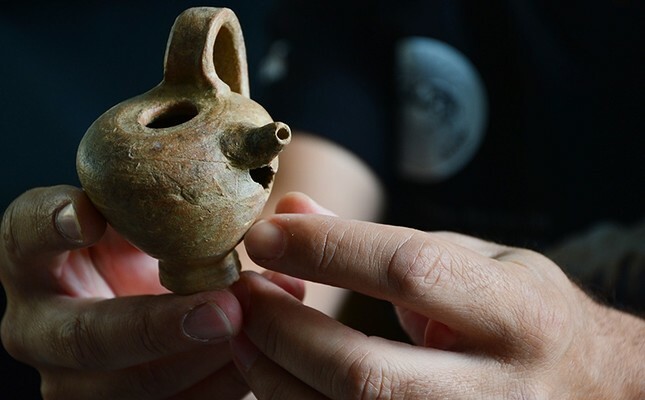 Member of the Parion Antique City excavation team and Assistant Professor of Archeology Department at Atatürk University, Hasan Kasaoğlu, said the baby bottle had a single handle and a pacifier-like spout. "These bottles were used during ancient Roman times 2,000 years ago as equipment to feed babies milk or food. These are earthenware produced as a result of firing," Kasaoğlu said, adding that such bottles could be found in areas dating back to early Roman period. According to the archeologist, such bottles could sometimes be discovered in baby tombs in areas dating back to early Roman period. He said they were left in tombs as burial gifts, adding that the bottles were equipment used in daily life. Kasaoğlu also said that the ancient baby bottles usually had a volume of 50-100 milliliters. "The products were made so that a baby could drink any liquid or baby food from it. They are all made from baked clay. The clay is molded by pressing, then fired and ready for use," Kasaoğlu added.